Looking for pro-forma invoice templates? We've got you covered! Do I need more than just a pro-forma invoice template? When you're not entirely sure what a service will cost your client, you'll want to send them a pro-forma invoice—basically an estimate of what you think it will cost. You might have to change this invoice several times if your estimate changes. 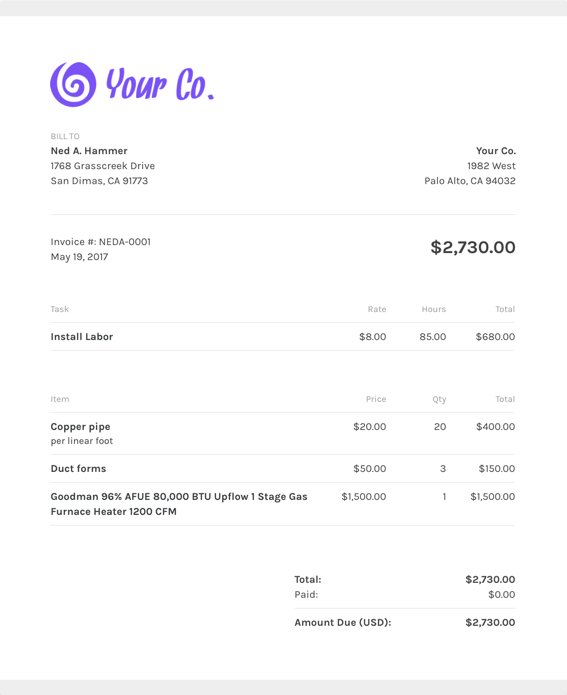 You really don't want to get stuck creating an entirely new invoice on your own every single time you need to adjust, which is why it's a good idea to use an invoice template that does most of the work for you. Now you can easily change the numbers if you need to. What should I include on my pro-forma invoice template? One popular thing about ZipBooks is that you can save default settings for your invoices (like company logo and header and footer color) once you nail down the invoice details. Using ZipBooks for your pro-forma invoice means never forgetting to include niceties that help you get paid faster like thank you notes. We’ve collected data from tens of thousands of invoices and use it to score your invoice based on what information you include so you’ll get you paid faster. Why should I use ZipBooks’ pro-forma invoice template to create and send my roofing invoice?